Long Island is located in Casco Bay on the coast of Maine, about a 45 minute ferry boat ride from the city of Portland. 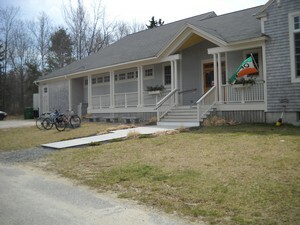 The library was built as an addition to the school about 15 years ago, as well as an art gallery and community room, all of which are used by the school. We are open 7 days a week, entirely staffed by volunteers. We offer a small meeting room, a computer room, Wi-Fi, a reading area, children’s space, and lots of wonderful books, DVDs, CDs, downloadable e-books, etc., ready to be plucked from the shelves. Every Friday morning there is a children’s time, and various authors come to the island for book readings. Stop by and see us – we’d love to show you around, and sign you up!